One of the unfortunate realities of owning an iOS device is that whenever a new one comes out, it introduces exclusive features that rarely make their way to older products. 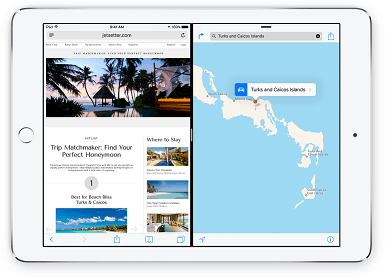 Split View, one of the best features introduced in iOS 9, is only available on the iPad Air 2, iPad mini 4 and the newly release iPad Pro so owners of older iPads can only look with envy as others around them run apps side-by-side. Of course, these restrictions do not apply on jailbroken devices and developer CP Digital Darkroom has already released a tweak that takes care of everyone. To begin with, you will need a jailbroken iPad running iOS 9. In case you are still on the fence about this whole thing, read our general guide on Cydia and jailbreaking as well as our guide on how to jailbreak iOS 9. To get the features in question, open the Cydia app on your jailbroken iPad and search for Medusa for iPad, a free tweak hosted in the BigBoss repo. Install it and the features will immediately become available in your device as you will not have any options to configure. Since you are using an older iPad, I am assuming you have never used either of these two features before but you should not worry as it is very simple. To use Slide Over, open an app and slide your finger in from the right edge of your iPad’s display (right to left swipe). This will open a panel that will reveal a bunch of app icons. Tapping on one of them will open that specific app right then and there. Sometimes, an app will already be opened when you Slide Over. When that happens, simply swipe your finger downwards from the top of the panel and you should see the original list of apps appear. To close Slide Over, slide your finger from the left edge of the panel to the right side. Split View can only be accessed after you “Slide Over” an app as it is actually an extension of that feature. With the Slide Over panel pen, pull the divider in the center towards the left side. This should automatically pin the two apps side-by-side so you can text while browsing the Internet, for instance. When you are done with the open apps, simply pull the divider to the opposite side.